Each year, ADF&G, Division of Sport Fish sponsors a cover contest for the Alaska Sport Fishing Regulations Summary booklets. Your child could be on the cover next year! Get outdoors, go fishing and make those memories last a life time. 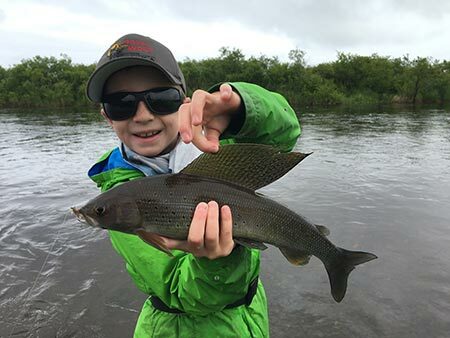 Pack your camera along with your rod and reel, and capture those memorable images of your family and children fishing in Alaska. And don't forget to send us your photos! To be considered for the cover, the primary person in the photo must be under the age of 18 when the photo was taken and the photo must have been taken in Alaska. We are looking for photos that represent what sport fishing means to young people and their families. Both the youth and the photographer will be credited inside the cover. Remember the photos will be considered for the covers of the SPORT FISHING regulations summaries. No images depicting personal use or subsistence fishing will be considered for the cover; hook and line/rod & reel only photos, please. Entries must be received at the Alaska Department of Fish and Game or e-mailed no later than 5 p.m. October 31st. A signed Photo/Model Release from the parent or legal guardian will be required for the winning entries to be used. Please submit photos in digital format via email, or 5" X 7" prints by mail or in person at an one of the Fish & Game offices listed below. The subject line of the e-mail must include the name of the water body or drainage in which the photo was taken. Digital photos must have a high pixel to inch ratio - a minimum of 600 pixels/inch. (If you do not know the ratio of the photo, blow the photo up to 8' by 10". If the photo is still clear and crisp at this size, it can be considered for the cover.) Electronic submissions may be no larger than 10MB. Please limit the number of entries to three per person. Name and age of the main subject(s). Photographer’s name and contact information. Name and contact information of the main subject(s)’ parent or guardian (if applicable). A brief description of the fishing adventure (what, when, where). By submitting your photo, you are giving consent to the Alaska Department of Fish and Game to reproduce this photo for use in the regulation summaries cover photo contest. To be considered as a finalist, the photographer and the legal guardian of the youth or youths in the photo will be required to sign a release form. The release form grants permission to the Department to credit and publish the names of the photographer and youth(s) appearing in the photo. or hand-delivered to our Douglas office at 802 Third St.